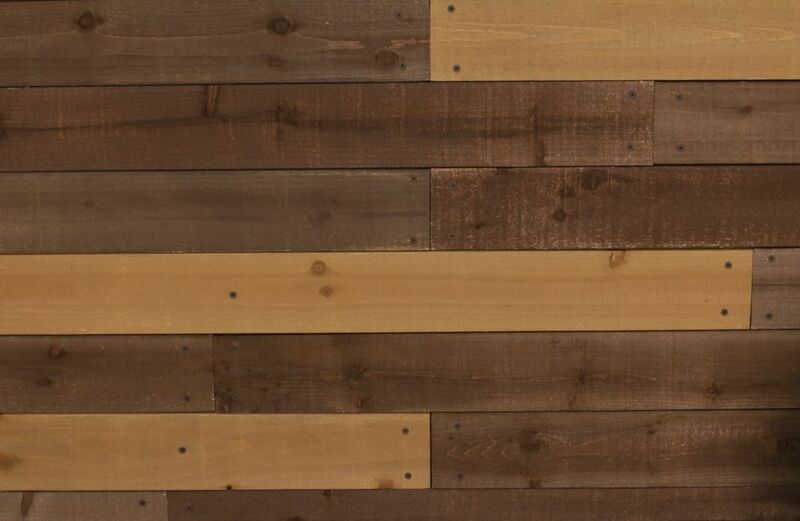 Add a touch of rustic-chic style to your room with this set of barn board wall décor. Each pack comes with a total of eight pieces in a variety of four different stained finishes, allowing you to arrange them to whatever best suits your taste. Made entirely from quality Fir wood, this set not only looks great but is also of the highest quality. Installation for this set is very simple, and can be done using one of three methods; adhesive glue or finishing nails. Instructions included. Please return to store for assistance. Weathered Barn Board Add a touch of rustic-chic style to your room with this set of barn board wall décor. Each pack comes with a total of eight pieces in a variety of four different stained finishes, allowing you to arrange them to whatever best suits your taste. Made entirely from quality Fir wood, this set not only looks great but is also of the highest quality. Installation for this set is very simple, and can be done using one of three methods; adhesive glue or finishing nails. Instructions included.